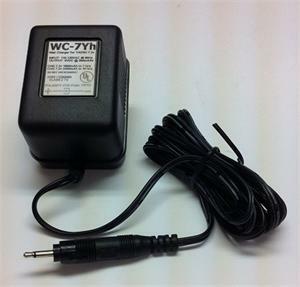 WC-7Yh : Wall Charger for 7.2 volt batteries for YAESU. Charges FNB-26 & FNB-14 style batteries from 1650mAh thru 2700mAh (FNB-26x, FNB-26xs, FNB-26xe, FNB-26xh, FNB-26xxe, FNB-14x,FNB-14xh, etc). Replaces original NC-28B. 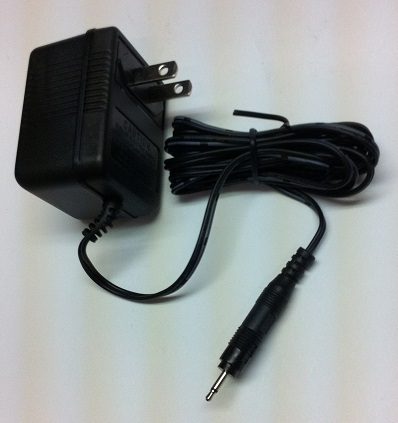 Plugs into 110-120VAC, other end plugs into battery. Output is 9VDC @ 250mA. Exclusive item from BATTERIES AMERICA. Pricing effective 2018. CBE-12 : Battery Eliminator for Yaesu FT-411, FT-470, FT-23, FT-43, FT-73, etc. 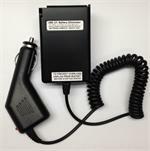 CBE-12 : Battery Eliminator for Yaesu radios such as FT-411, FT-470, FT-23R, FT-43R, FT-73R, etc. Slides onto bottom of radios. FBA-17: Alkaline Battery Case for Yaesu FT-411, FT-470, FT-23R, FT-43R, FT-73R, etc. Replaces FNB-17, FNB-10, FNB-14, FNB-11, FNB-12, FBA-9, FBA-10. Load with 6 x AA batteries for instant power. FBA-12 : 6 x AA battery case for Yaesu radios. Fits FT-530, FT-416, FT-76, FT-26 etc. FBA-12: Alkaline Battery Case for Yaesu FT-530, 416, 415, 816, 76, 26 radios, etc. Snaps open, holds six AA cells. Handy for instant power! Black color. Designed by Batteries America. 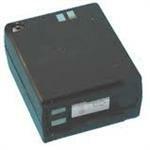 CBE-27 : Battery Eliminator for Yaesu FT-530, FT-816, FT-416, FT-26R, FT-76R, etc. FBA-12h: 10xAA battery case for Yaesu FT-530 etc. Handy for instant Hi-Watt power! FBA-12h: Alkaline Battery Case for Yaesu FT-530, 76, 26, 415, 416, 816, etc. Opens up to hold 10 Alkaline AA cells for instant Hi-Watt power ! Case is approximately 3.5" tall. FNB-14x: 7.2 volt 1800mAh long-life NiMH battery for Yaesu FT-411, FT-470, FT-23R, etc. Replaces FNB-17, FNB-10, FNB-14 etc. Re-charges with desktop smart-charger or with wall charger. FNB-26x : 7.2v 1800mAh Ni-MH battery for Yaesu FT-530 etc. 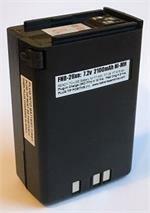 FNB-26x: 7.2 volt 1800mAh rechargeable Ni-MH battery pack for Yaesu FT-530, FT-26, FT-76, FT-416, FT-816 radios, etc. Replaces FNB-25, FNB-26, etc. Provides extended operating time. 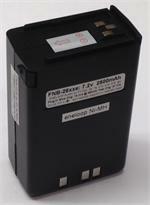 FNB-26xe: 7.2v 2100mAh Ready-to-use NiMH battery for Yaesu FT-530, etc. PRE-CHARGED & READY TO USE ! FNB-26xe: 7.2 volt 2100mAh rechargeable NiMH battery. Fits FT-530, FT-26, FT-76, etc. Replaces FNB-26. Arrives to you PRE-CHARGED and READY TO USE. Retains its charge for up to a year when not in use! FNB-14xs: 7.2-volt 2200mAh rechargeable long-life NiMH battery for Yaesu handheld radios, such as the FT-411, FT-470, FT-23R, FT-43R, FT-73R, FT-811, etc. Provides extended operating time, with 2.5W Tx power. Battery is 2.6" tall. 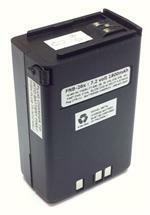 FNB-26xxe : 7.2 volt 2550mAh Ni-MH rechargeable battery for Yaesu FT-530 etc., made with eneloop pro cells. FNB-26xxe: 7.2 volt 2550mAh Ni-MH rechargeable battery for Yaesu radios. Made with ENELOOP PRO cells. Arrives to you PRE-CHARGED and READY TO USE ! 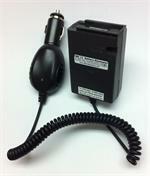 Fits Yaesu radios such as FT-530, FT-26, FT-76, FT-415, FT-815, etc (worldwire versions). 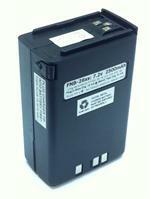 FNB-26xh: 7.2v 2700mAh LONG LIFE battery for Yaesu FT-530 etc. 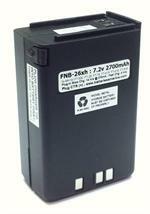 FNB-26xh : 7.2 volt 2700mAh ULTRA-LONG-LIFE rechargeable Ni-MH battery pack for Yaesu radios. Fits the FT-530, FT-26, FT-76, FT-416, FT-816 etc (worldwide versions).